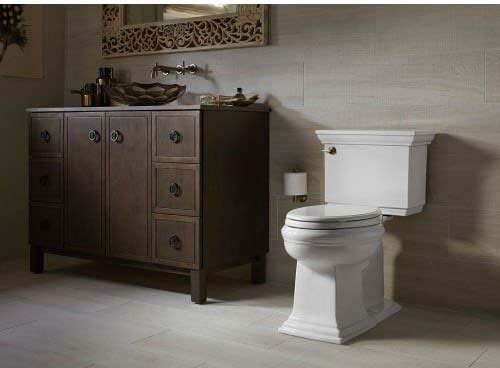 The stately Kohler K-3817-0 Memoirs toilet from the Kohler Memoirs Collection is a two-piece, comfort height, water efficient toilet. Will it add some style to your bathroom? It looks great but is it good value? How does it compare to other toilets? We hope that this Kohler Memoirs Toilet Review will answer these questions and more. Of course, choosing a toilet design is a personal decision. Having different shapes and sizes of toilets allows you to choose a specific type of toilet to suit your bathroom style. This specific toilet has a classic look to it. It is called Memoirs, ‘Stately’ and it does have a regal look to it. The tank lines are sharp, the tank is square and is crowned with an attractive wide lid. I think this design definitely does give a good first impression. The front of the toilet also has a solid square shape that is quite different to many round shaped modern toilets. 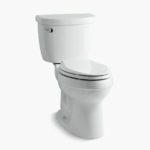 The Kohler Memoir is a comfort height toilet which means it is ADA compliant and suitable for people with disabilities. A comfort height toilet is roughly two inches taller than a standard height toilet, therefore a good choice for not only tall people but also for people that find it difficult to stand up and sit down. However, a comfort height toilet may be a little less suitable for very short people and young children. The Kohler Memoirs Toilet is ADA Compliant. This unit is a two piece toilet with an elongated bowl. A two piece toilet will need extra cleaning over time compared to a one piece because dirt will find it easier to accumulate in crevices. However, two piece toilets are usually cheaper that one piece toilets. The elongated bowl is bigger than a round bowl, which will be more comfortable for larger people. An elongated bowl may not be the best choice for very small bathrooms as it will take up a little more space. Overall, this Kohler Memoir toilet is a great looking model, that will certainly add a stately stylish look to your bathroom. Now let us see how it performs. Firstly, this toilet is very water efficient. 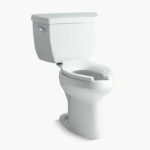 It uses 1.28 gallons per flush (GPF), which makes this toilet WaterSense certified. Comparing this to a modern 1.6 GPF toilet, this unit will use 20% less water per flush. However, if you are upgrading from an older standard toilet that uses on average 3.5 GPF, then this Kohler Memoir toilet will save you up to 16,500 gallons of water per year. These water reductions will help the environment and will also be fantastic for water bill savings. The Kohler Memoirs Toilet is WaterSense Certified – 1.28 GPF. This efficient usage of water does not prevent a powerful flush. The Kohler AquaPiston technology allows water to flow into all sides of the bowl and rim (360°), making sure that the whole bowl is receiving a good cleaning per flush. The canister is also flapperless, meaning no leaks and also it provides 50% more rinse than previous Kohler models. If you have some experience with DIY or are brave enough to give it a go yourself then you should be more than capable of installing this toilet. It has a standard 12″ rough in and it is easy to connect the tank to the bowl. To find a leading competitor that will compare well to the Kohler Memoirs Stately toilet, I found a toilet that looks quite similar and matches well performance wise. The toilet I have chosen is the Toto Promenade II. I believe the Kohler Memoirs Stately design is quite distinctive compared to many other models. Its square regal style is very different to most other modern toilets that usually have a more smooth round design. The Toto Promenade II has a similar look to it and also has a squarish design. Both are very attractive toilets. Both are ADA compliant and have similar floor to seat measurements. The Kohler has the patented Comfort Height Seat, where as TOTO has their patented Universal Height Seat. The Comfort Height and Universal Height are suitable for the elderly, disabled and for tall people. Both toilets only use 1.28 GPF making them both highly efficient and WaterSense certified. The Promenade II uses the Tornado Flush System and the Memoirs uses the AquaPiston Technology. Judging by customer reviews, both toilets perform well and have good flushing power. One main difference between these two is that the Promenade II is a one piece toilet and the Memoirs Stately is a two piece toilet. This would normally make a difference in price, cleaning, leaking and installation. However, when it comes to leaking and installation, as you can see in the first video above, the Kohler durable canister has 90% less exposed seal material compared to a 3-inch flapper, providing a leak-free performance. Also, the second video demonstrates that this toilet is very easy to install. Although a two piece toilet, you will not need to worry about it ever leaking. That being said, a two piece toilet will have more crevices for dirt and bacteria to grow, therefore it will need more maintenance to keep clean compared to a one piece. Also, as expected this Kohler Memoirs Stately two piece toilet is cheaper compared to the Toto Promenade II one piece toilet. Overall, these toilets are great toilets and will definitely add a classic look to any bathroom. Both perform well and are of similar size and shape. If you can’t choose between the design and you don’t mind having a two piece toilet, then the Kohler Memoirs stately is the less expensive option. If you would like to see what the TOTO Promenade II looks like, then check out the full review. The Kohler Memoirs Stately Toilet is guaranteed to add a touch of class to your bathroom. Not only does it have a fabulous design but its flush performance is also excellent. This Stately toilet is definitely worth considering. The Kohler Memoirs Stately Toilet is a classic looking model that will add a bit of royal class to your bathroom. Its comfort height measurements and elongated bowl make it a lot more comfortable for more people, especially for people that find a standard height toilet seat difficult to use. It is also a very efficient toilet and only uses 1.28 GPF. It is WaterSense certified so will be good for the environment and save you money on water bills. Overall, this toilet is definitely one to consider for your bathroom. I hope that this Kohler Memoirs Toilet Review was able to answer any questions you had about this particular unit. If you would like to let us know what you think of this model or have any other questions, please leave a message in the comment section below.